On a sunny February day we decided to stop by Shilling for lunch with our toddler. 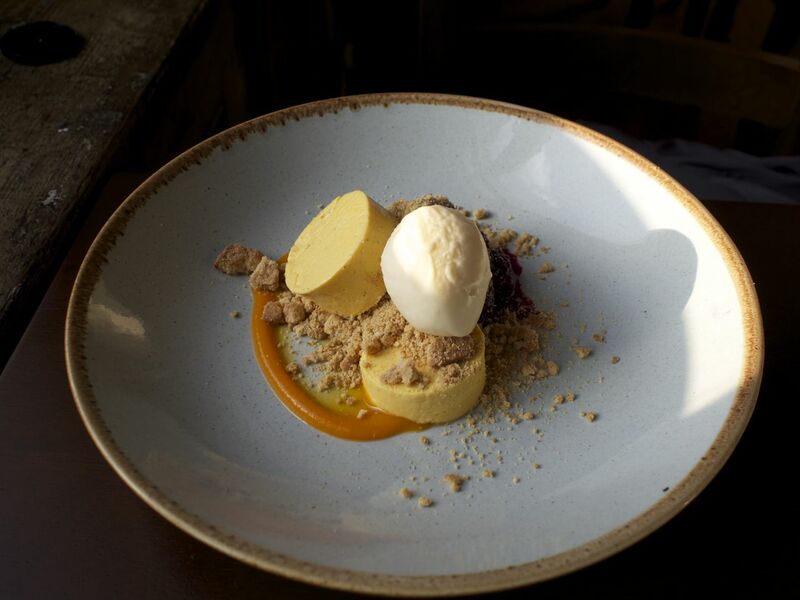 We’ve been following their progress with interest on instagram since they opened to minimal fanfare just before Christmas, and were keen to sample some of their grub. We received a warm welcome as we walked into what used to be Rumpoli’s Italian restaurant. 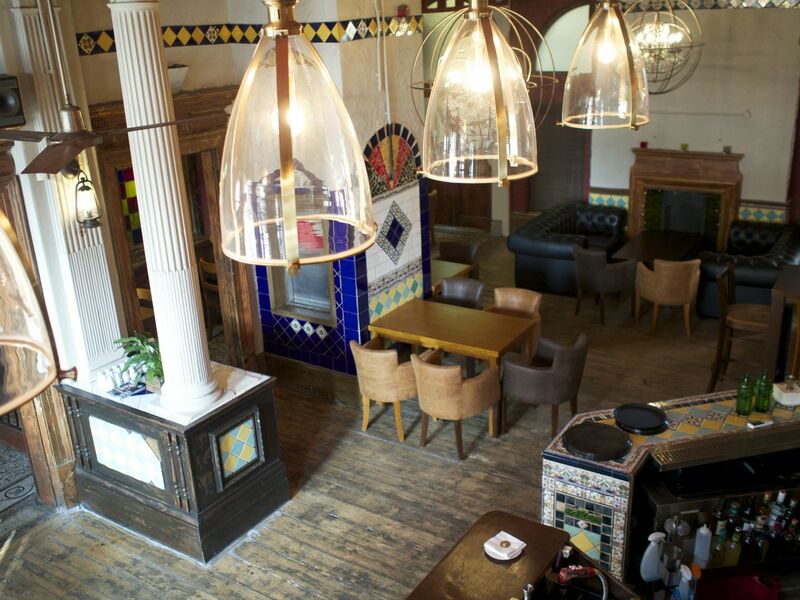 The interior has been lovingly adapted but they’ve kept a lot of the old place’s charm. Rather than faux shabby chic like so many places in Newcastle this place is authentic, and the result is refreshingly quirky amongst a sea of overdone developments. They have two levels, with the top being reserved for diners. We chose to sit upstairs and got a great table next to the window. Perfect for people watching with views of the bridges. 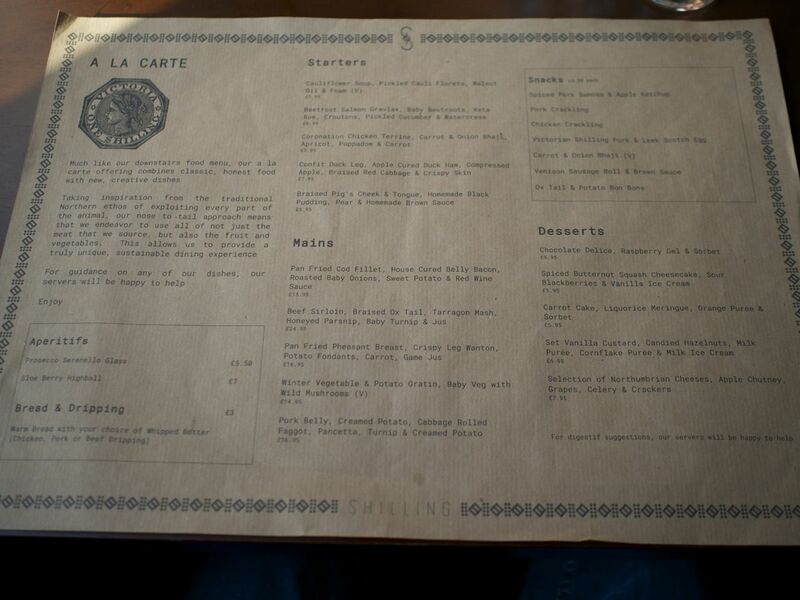 We were given an assortment of menus – early bird, a la carte and a bar menu. 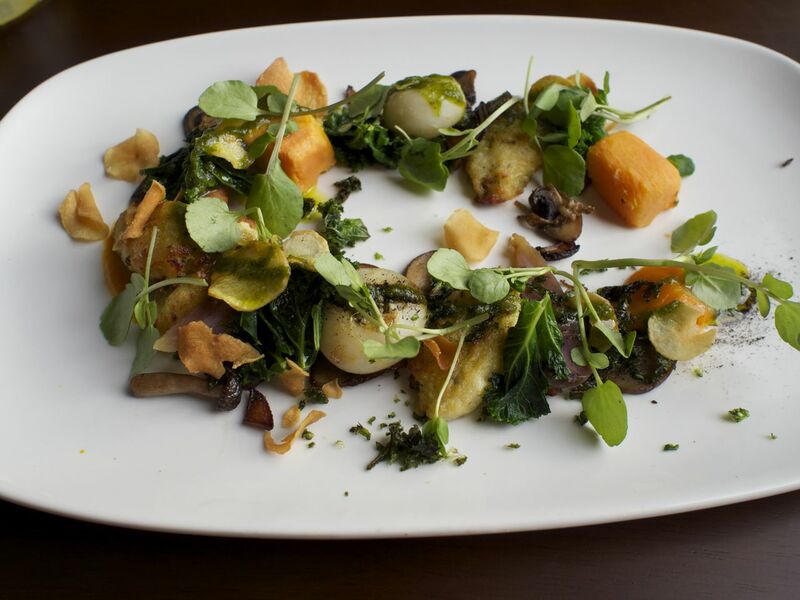 The menus focus on ‘nose to tail’ dining – in other words they use every bit of the animal, fish or vegetable and try to waste as little as possible. The head chef used to be a butcher so he knows a thing or two about meat. Since they’d had a very busy Valentine’s day service the day before a lot of the a la carte wasn’t available, which was a shame as it sounded really interesting. Luckily there were some good options available from the early bird menu (two courses for £15/three for £20 Mon-Sat 12-7pm) so we went for that instead. Little Dude made instant friends with our waiter George whose hand he grabbed to show him a bus out of the window. George was great with him, which always makes for a pleasant dining experience! Shilling has a great reputation when it comes to cocktails. 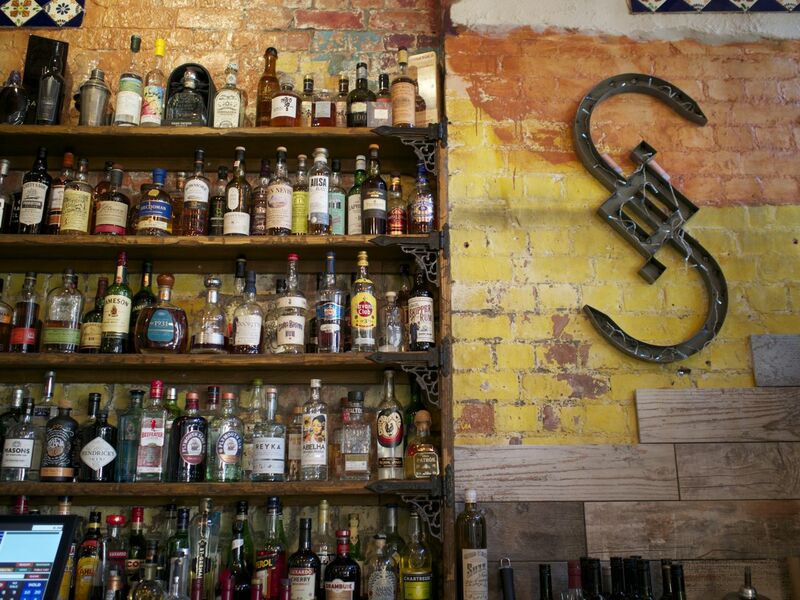 The guys who set it up used to be the mixologists at Popolo (before it moved) and so they know a thing or two about drinks. We were on the soft drinks on this occasion but will be back to sample some ‘proper’ drinks next time! The starters arrived and we wasted no time getting stuck in. 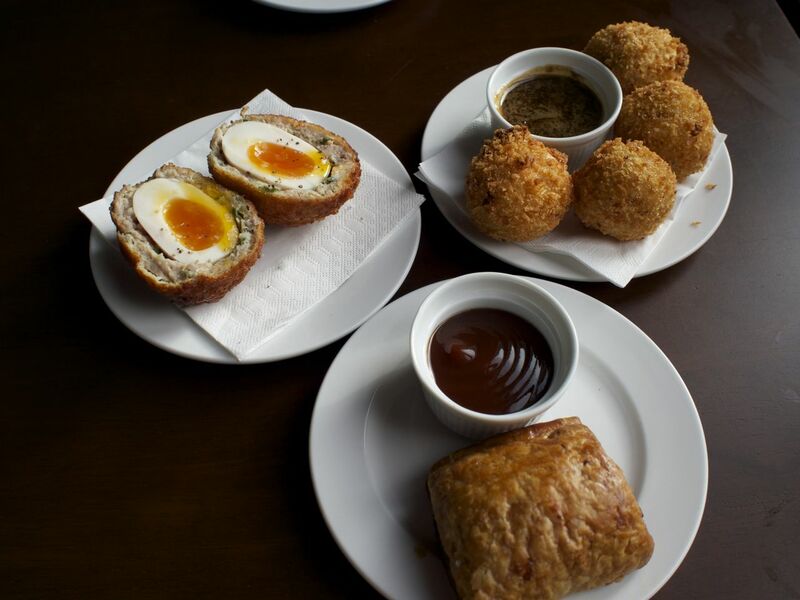 The scotch egg was incredibly good, with the obligatory running yolk, herby sausage meat and crispy coating. The venison sausage roll was very meaty, filled to the brim with quality, well flavoured meat and great dunked in some brown sauce. The bon bons were like mini potato croquettes but with pulled oxtail in the middle. Dipped in homemade gravy they were deliciously indulgent and satisfying. There was no children’s menu but George was quick to point out that they could do something like a half portion of fish and chips (£4.95) for LD. They went down a treat, even though he’d had loads of the starters too. He wasted no time getting stuck in so there was no time to take a photo…! The gnocchi had been fried and was delicious, but the real highlight was the veg. The chef (who I reckon has Michelin aspirations) had cleverly used a melon baller and other kitchen implements to create mysterious balls of root veg. It really made us think about what we were eating, as we were trying to figure out what it was! Everything was well flavoured and every mouthful tasted different, which I love. There wasn’t a huge amount of gnocchi, which was fine as we’d also had starters but if you’re after something more filling then I’d probably go for a different dish. 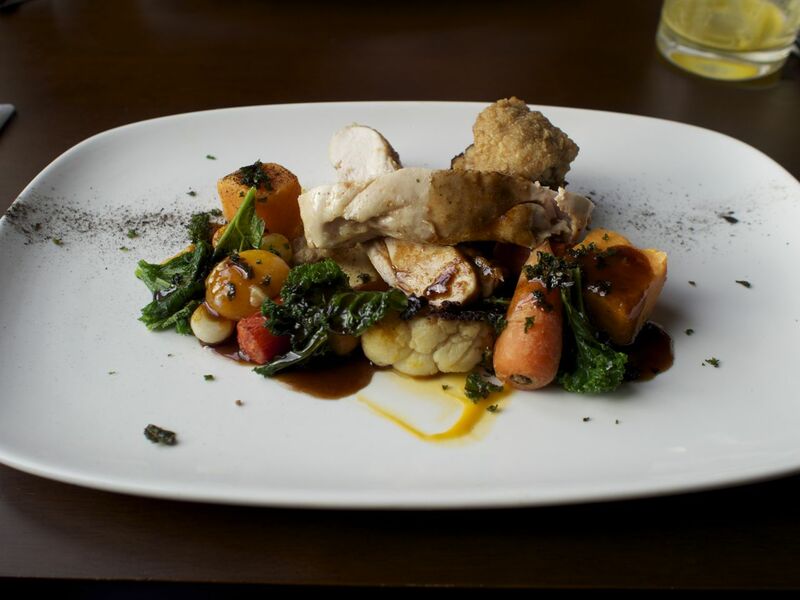 The Mr had gone for the chicken breast, winter vegetable gratin, crispy skin, greens and red wine sauce. As he is lactose intolerant they swapped the accompanying potatoes (which contain dairy) for more chicken and veg. He declared the chicken ‘the most tender I’ve ever tasted’. The chef had achieved what is basically the impossible – the most perfectly cooked chicken, which melted in your mouth. We concluded that it could only have been achieved by perfect timing and sous vide, which George confirmed. The rest of the dish was also exquisite, with more tantalising vegetables and deliciously crispy skin. 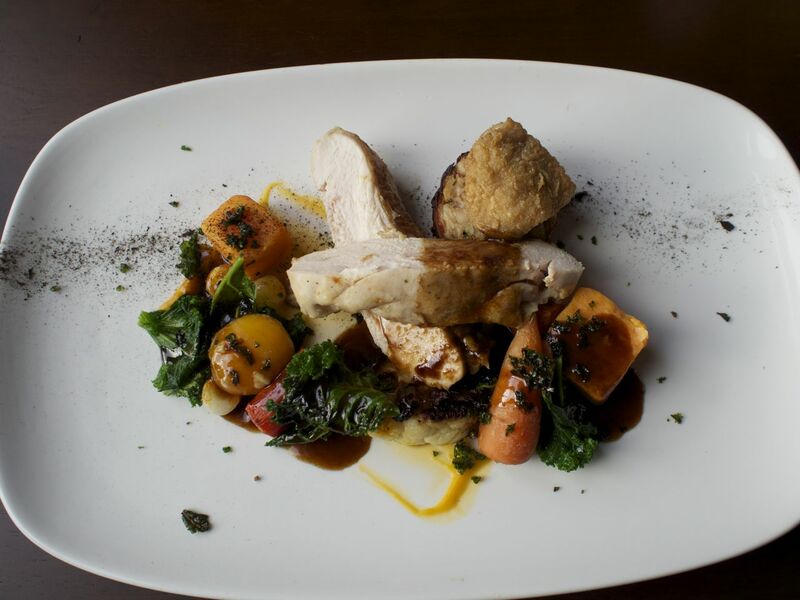 Throughout our meal the service was great, very attentive and friendly and although there was a little wait for the food it was well worth it. 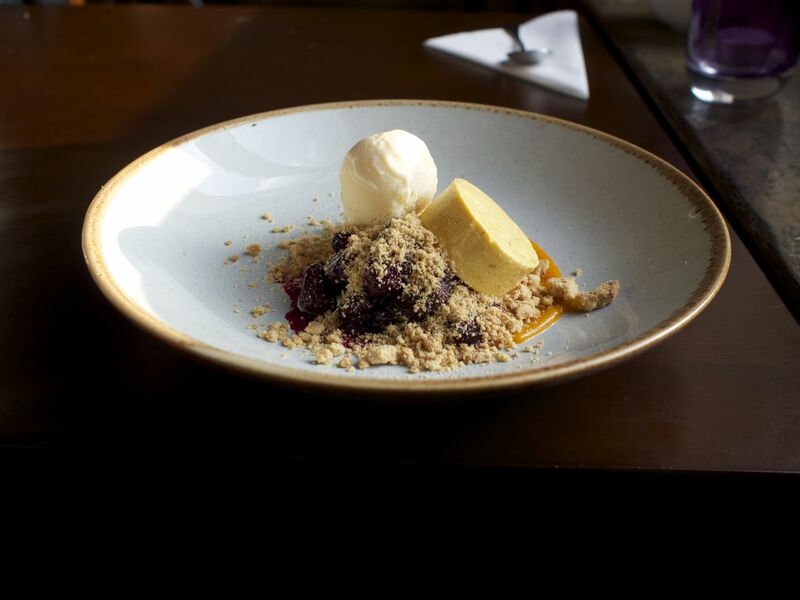 We decided we had a little room left for dessert, so I chose the butternut squash cheesecake parfait, sour blackberries and vanilla icecream from the early bird menu and the Mr was delighted to be offered a selection of sorbets as he loves it when he gets this option. We ordered a portion of vanilla ice cream for LD (£2.50). I nipped to the toilets with LD and was a little disappointed that there were no baby changing facilities. A pull down changing table on a wall would have been ideal for those bringing babies and toddlers. Meanwhile our desserts had arrived. My deconstructed cheesecake was again beautifully presented. The butternut squash parfait was a creamy, jelly-like disc and tasted great, just on the right side of sweetness. The sour blackberries were really rather tart, perhaps a little too sour for my liking. When combined with the ice cream and biscuit crumbs the whole thing was very pleasant though and perfect if you’re after something sweet without being sickly. 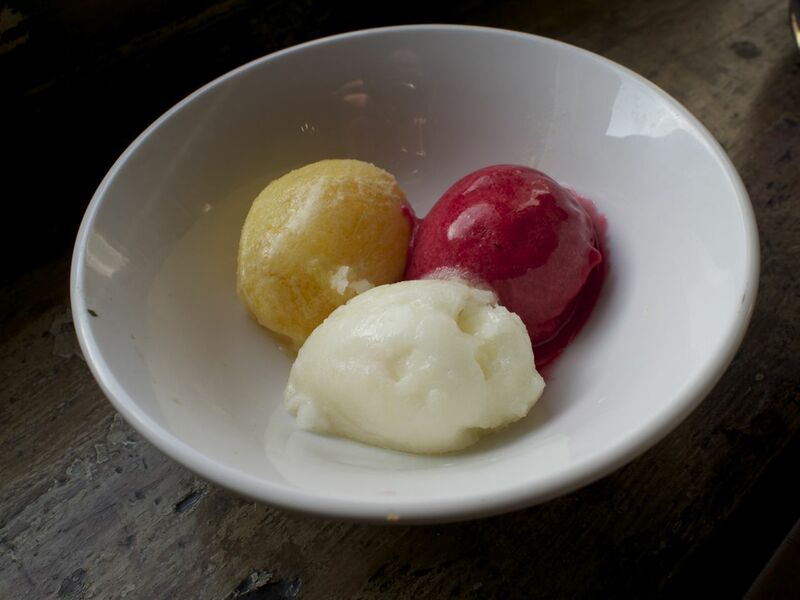 The Mr enjoyed his sorbets, with three delicious flavours to chose from. His favourite was the citrussy orange one. LD also had a glass of freshly squeezed orange juice which is so hard to come by in Newcastle, and it took us right back to our holiday to Soller in Mallorca last summer. We reluctantly said our good byes to George and the Chef, who we could see through the kitchen pass. 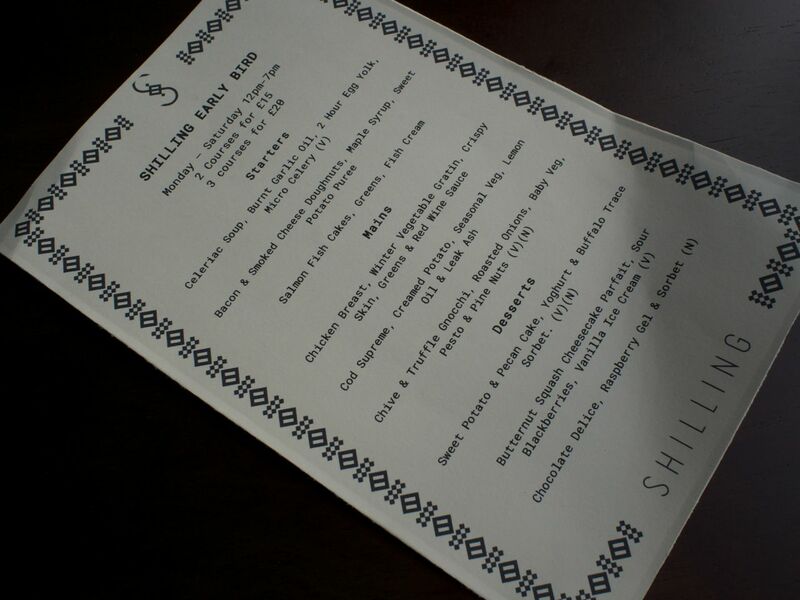 Shilling is the type of place that manages to be cool and yet comfortable, with food that is creative and delicious. 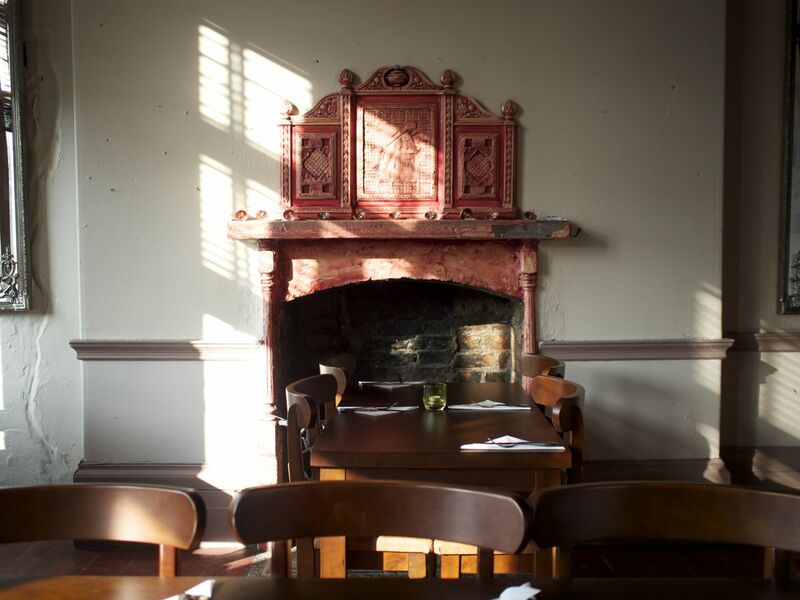 We will certainly be back, and are excited to try some of the other dishes on the menu. Thanks for reading! Follow me on Twitter, Facebook and Instagram for updates. We were provided with a complimentary meal for the purposes of this review. However the opinions expressed in this article are honest and true to experience.